Come to Ruthie’s Notions in Baker, Florida today! We specialize in Brother and Baby Lock Embroidery, Sewing, Quilting Machine and Sergers. We are a Brother and Baby Lock Platinum Dealer, and #1 Baby Lock Retailer, Single Location, for over 6 years in a row! Do you have a Baby Lock machine in need of repair. Don’t worry, we are also an Authorized Baby Lock Repair Center! 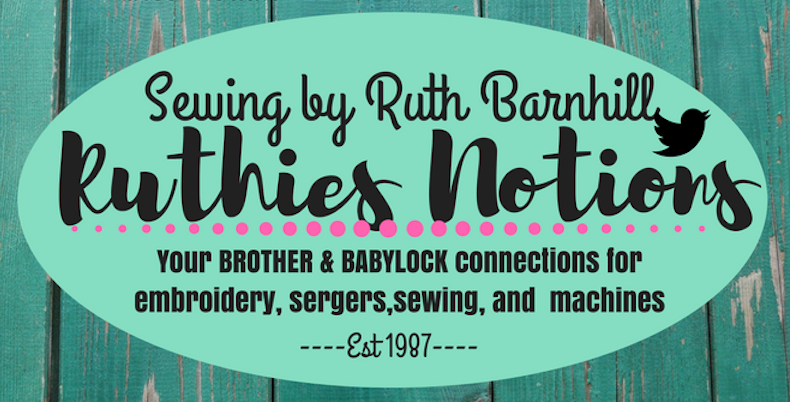 At Ruthie’s Notions, we also offer one on one training with the machines you purchase from us. Also,whether you purchase your machine from us, or already have a machine, we have Exciting Classes EVERY MONTH, and Most of them are FREE! Go to our Classes and Events page to find out more and to register for classes. Each one is quite different, and you learn so much! 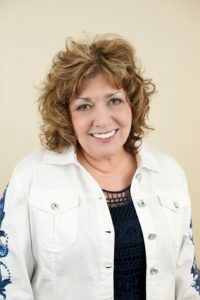 Ruthie has sold Baby Lock machines for over 30 years and has ben top in sales since the 1st year she ever started selling them. Praise the Lord Jesus! Ruthie and her husband Willie D has won several trips to Hawaii, Japan, England and Italy. “We had the most wonderful trips”. Ruthie worked at a factory in Crestview called Alatex also Vanity Fair too and when the factory closed down Ruthie started selling her first machine believe it or not from the extra bedroom in the house. Then, Ruthies husband Willie D, closed in their single car garage and worked out of there for 10 years. That’s when they bought the little 1951 house across the street and added a 1200 sq ft classroom and have grown and grown. 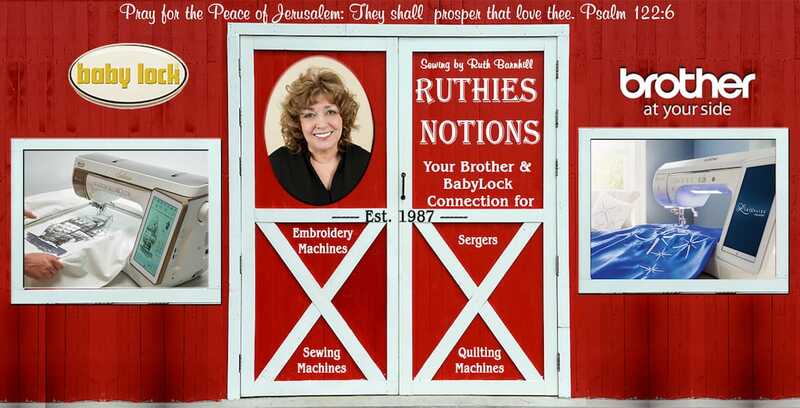 If you have never been to Ruthies Notions, what are you waiting for?!! Noone in the whole USA does classes like Ruthie does. She feeds you some of the finer country fixins’ you ever ate! To top it of, most of the classes are FREE!!! Can you stand it! We Love Our Baby Lock Machines! Baby Lock equals excellence. They stand behind their Baby Lock brand of machines and has become better ever year with the latest quality sewing, embroidery, and quilting machines. And of course the outstanding line up of Baby Lock Sergers in the USA is untouchable in the world today! Every upper looper that goes into every Baby Lock Serger is hand polished like the finest piece of jewelry you could buy anywhere. Most of all the parts that go into the Sergers are made at the factory with the greatest precision you ever saw. The Japanese are so humble. They do not want to be tipped, they want to give you an excellent product so you will want to buy more. Some of their very first Sergers are still working today. All the people from the factory came out to greet us when we got there and they all came outside when we drove off and waved to us as we left their wonderful factory where are wonderful Baby Lock Sergers are manufactured. Margaret Tully showed the Japanese how to do a wave stitch and the next year we had a wave stitch on our Baby Lock Sergers. Ruthie asked while they were at the factory for the wave stitch on the Evolve 8-thread Serger and the next year we had the Evolve Wave Serger!! Our Ovation Serger was one of the best Sergers I ever saw. Now we have the brand new Baby Lock Triumph 8-thread Serger. Praise the Lord on High for blessing us with another outstanding New Triumph Baby Lock Serger. Wait until you experience the new Triumph in person. You will have to buy one and take it home!! Click the following link to learn more about our sales and specials. Baby Lock for the Love!